It’s time for G.I. Joe to track down Cobra! And it’s time for another wave for the new G.I Joe Pursuit of Cobra! Awesome action figures with killer weapons! Authentic hero likenesses. Loaded with weapons and accessories. Compatible with your favorite G.I. Joe 25th Anniversary and Movie toys! Wave 2 will hit Toywiz Malaysia and Toy Garden very soon! Years in the making, G.I. Joe is back with the thrilling the G.I. Joe: The Pursuit of Cobra action figure line! Chase down the biggest villains in America with these incredibly articulated and well-armed 3 3/4-inch action figures. Featuring great likenesses and tons of articulation, each figure is loaded with weapons and accessories. Latch on to them now! 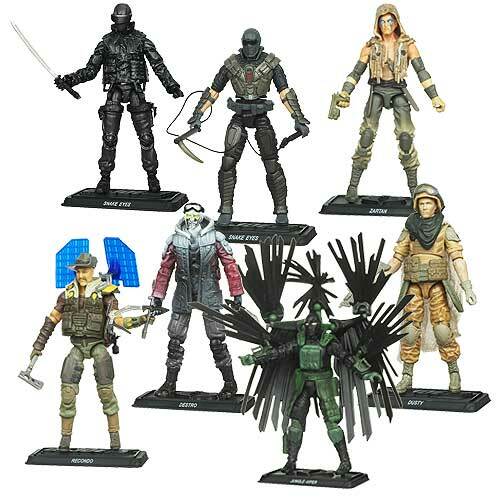 This Wave 2 case of 12 action figures includes: Snake Eyes v5, Snake Eyes v6 Feature, Zartan v2, Recondo v1, Destro v2, Jungle-Viper v1, and Dusty v1. RM39 each and some are sold in sets only.